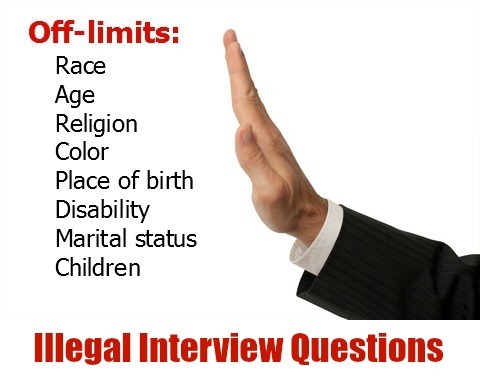 List of illegal interview questions. Employers should avoid asking these prohibited questions in a job interview. Candidates who pick up on illegal questions should know how to deal with them in a professional manner during the job interview. It is important to be aware that interview questions should be directly related to the job opportunity and not used to find out personal information. Find out the best way to handle inappropriate interview questions. Certain laws regulate the questions an interviewer can ask the job candidate. In line with discrimination law, interview questions must be related to the position and should be designed to answer the question,"Does this person have the necessary qualifications, skills and abilities to perform this job?" Do you plan to start a family soon? When did you last have a physical examination? What outstanding debts do you have? Go ahead and answer the question directly. If you are comfortable with providing the answer, just respond and move on to the next question. Remember though that you are giving information that is not related to the job and may be giving details that impact negatively on you. Refuse to answer the question. This is potentially a confrontational response and should be saved for questions that are truly offensive and invasive. If the question makes you very uncomfortable you could respond with: "That is a strange question, I haven't been asked that before in an interview. Why have you asked me that?" However if you are asked a number of inappropriate questions you may need to consider the suitability of the job and company. The most effective response is to not answer the inappropriate question directly but to determine the reason or intent behind the question. Try to find out what the interviewer is really asking by rephrasing, clarifying or questioning. Is it legal to ask age in an interview? Age-based interview questions are illegal. With a few exceptions, the only legal age-related question is,"Are you over the age of 18?" Do not answer your age directly but deal diplomatically with this by asking the interviewer: "Are you referring to the number of years experience I have in this field?" Can an interviewer ask your religion? Illegal questions about religion may be asked to see if your religious beliefs and practices may interfere with your work schedule. An appropriate response is "My religious practices do not impact on my work" Employers are allowed to ask if you are available to work on Sundays. Can you be asked if you are married in an interview? Questions about your marital status are illegal. 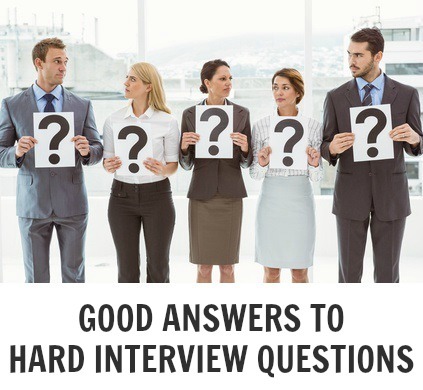 You also cannot be asked any questions about your spouse in an interview. If you are asked about your marital status it is important to figure out the intent behind the question before you respond. If you think it is merely a friendly, get-to-know you type question there is no harm in responding honestly and politely. If you think the motive is more complicated you can respond along the lines of "I make sure to keep my personal life separate from my work so this has no impact on my ability to do the job." Any questions about existing or future children are considered illegal. Here are some good ways to handle these inappropriate interview questions. The intent behind interview questions about your family-status is often to determine your reliability. Avoid any specific details, rather answer with a broad statement along the lines, "I have made the necessary arrangements to ensure that I am able to meet all the job requirements." Reassure the interviewer further and refer to your record of reliability in previous positions. Questions about starting a family is designed to explore your long-term commitment to the job. You can respond by emphasizing your commitment without actually answering the question directly. For example: "I am really focused on my career and you can be sure of my commitment to this job." Be aware of discriminatory gender-based interview questions. Often these questions seem innocent but are actually a subtle way of exploring how a candidate's gender may impact on job performance. A good example of this type of question is "How do you feel about managing a team of men? ", or "How do you feel about reporting to a female supervisor? " Unless the job requirements demand a specific gender the employer may not directly ask about how your gender could affect performance. Respond with a generic answer that does not mention gender. For example "My management experience includes successfully leading a diverse team." What about health-based illegal interview questions? Questions about health and medical status are usually illegal interview questions. Consider why you are being asked this question. The question's intent is probably to explore your ability to perform job-related functions. Responding with the general statement, "I am fully able to perform the essential job functions as you have described them" is both professional and reassuring. What other types of questions are illegal to ask during an interview? Questions about your birthplace and citizenship are illegal. You can rephrase the question to check exactly what the interviewer is asking. "Do you want to know if I am authorized to legally work here?" Questions about your home language are also illegal. These type of inappropriate questions can be answered in the following positive manner "I can fluently speak, read and write both English and Spanish". This skill may enhance your suitability, so point it out while not directly answering the illegal question. Questions about your financial situation including debt and property ownership are not allowed. Employers need your permission before asking about or investigating your credit history. Questions about your social lifestyle including drinking can violate the American with Disabilities Act. You can respond with "I prefer to keep my social and work life separate." 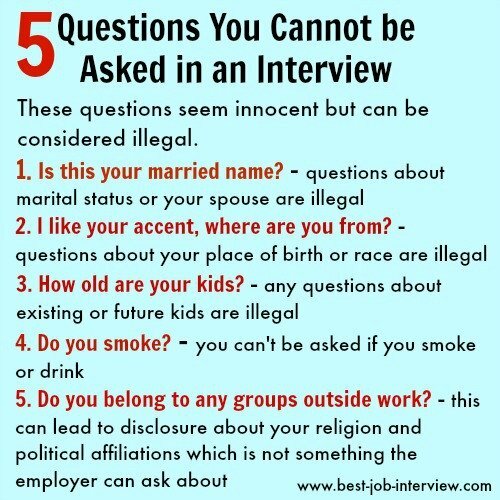 Most interviewers do not deliberately ask illegal interview questions, it is often unintentional. It is up to the candidate to recognize an illegal question and respond in an appropriate and professional manner. Interviewers should keep the interview focused on the requirements of the position and exploring the skills and competencies required to perform the job properly. Interview answers to common job interview questions. Good questions to ask in your job interview. Dealing with tricky interview questions about gaps in employment, reasons for leaving and salary. These are the questions that candidates should not ask in their job interviews.